To get full specifications and details on your conveyor, LOOK UP THE SERVICE MANUAL. Longevity and efficiency are two of the top requirements for our clients. Luckily, 50 years in the conveyor manufacturing industry has given Dorner Conveyors the experience to master both. By providing custom solutions to fit industry demands, we ensure each system is utilized to the fullest. We often find our systems to be the lifeline of our customers’ production, giving them the ability to effectively move product in a timely manner. Peak performance is obtained when regular inspections, proper maintenance, employee training, and stocked replacement parts are kept up-to-date. 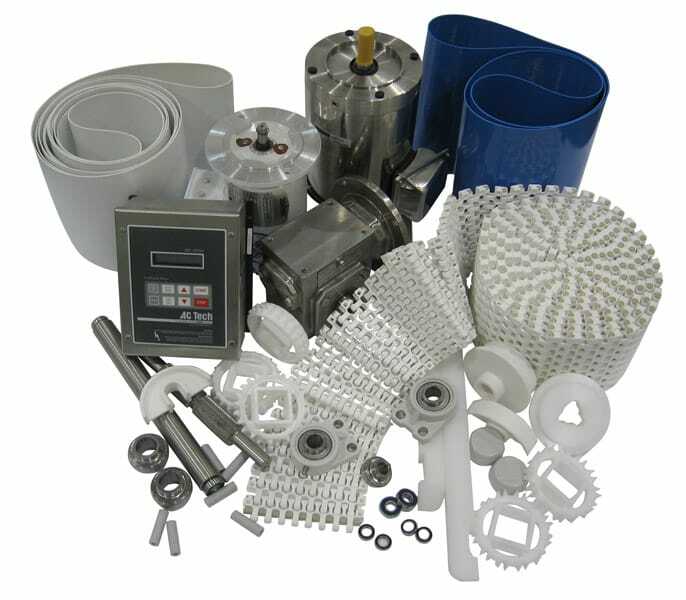 When considering your conveyor system, replacement belts and parts cannot be overlooked. Keeping core parts in stock will decrease downtime and keep costs low. By choosing the right conveyor and keeping up with auditing programs and preventative maintenance, you’ll save money and be more likely to increase the service life of your system. One important part of this process is spare parts. Keeping spare parts on hand will allow you to quickly repair the conveyor equipment and minimize production downtime. At Dorner, we make this maintenance process easy. Our Parts Auditing Program, a value added free service, provides you with an accurate, professional opinion of which spare parts are necessary to keep your Dorner conveyor and equipment operational. Once you have consulted with our inspector, Dorner will provide you with an audited list and quote of the recommended spare parts. Plus, we’ll provide a report of any pending maintenance concerns that you may want to address. With Dorner’s Preventative Maintenance Program you can request a Dorner technician visit for an inspection and adjustment of all your belts, pulleys, bearings, drive train, gearmotors and accessories. Our reliable and efficient service process is designed to get your conveyor up and running to save you both time and money. By streamlining the inspection, repair, and maintenance process, you’ll be able to improve your conveyor system in the most convenient way possible.